During World War I, many white men were away being soldiers. Because of the war, no new people came from Europe to take their places. So some black people found work in factories. That paid much better than any work they had had before. Some black men also fought in World War I, and they came back as veterans who were used to being treated as responsible citizens. Black people built neighborhoods and towns where they could live better lives. They became doctors and lawyers and shopkeepers and barbers. Most white people wouldn’t go to a black doctor or lawyer. So black doctors treated other black people (who couldn’t go to a white doctor or lawyer, either). Black lawyers wrote wills for other black people. They were still much poorer than white people, but they were richer than before. The richest black town in the country was Greenwood, Oklahoma (near Tulsa). Black families bought pianos and gave their kids music lessons. But white people didn’t like black people to live well. 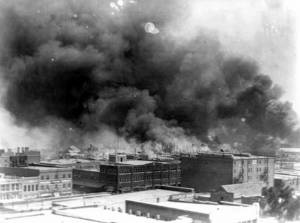 In 1921, a white mob burned down and smashed most of Greenwood, and killed more than 300 black people who lived there. Other black towns also suffered violence. In World War II, in the 1940s, the same thing happened. 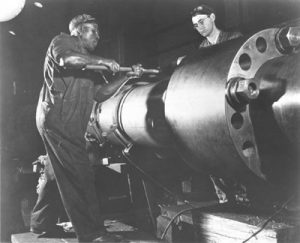 More black men and women worked in factories, making weapons and building boats for the war. By the 1950s, new government farm policies pretty much ended sharecropping in the United States. These factory workers’ children were richer and better educated than their parents or grandparents had been. But they still suffered from all kinds of laws that favored white people. For example, white people had a much easier time getting home mortgages from banks, and loans to start their own business. White people could buy houses in nice neighborhoods with good schools, but black people – even with plenty of money – could not buy houses in those neighborhoods. In the 1950s, black people protested to try to get rights equal to white people. In 1955, the NAACP organizers Rosa Parks and Jo Ann Robinson started the Montgomery Bus Boycott. 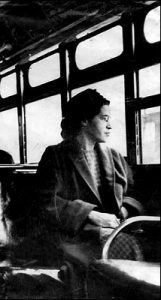 The boycott won the right for black people to sit with white people on the city bus. Some black people, like the boxer Muhammad Ali and the preacher Malcolm X, decided to stop being Christians, the religion of the old slave-owners, and convert to Islam. Other black people stayed Christians and used their religion to organize protests. The Christians’ most important leader was Martin Luther King, Jr. Dr. King helped to get Congress to pass a Civil Rights Bill in 1964. The Civil Rights Bill made it illegal to keep black people or women out of any public place, like a swimming pool or a restaurant. The Civil Rights Bill also made it illegal to refuse to hire black people or women for a job just because they were black or women. The next year, Congress passed the Voting Rights Act. That made sure black people could vote in elections. But Malcolm X was shot dead in 1965, and a white man who was angry about Dr. King’s work shot him dead in 1968. Because of the Civil Rights Act and their own work, black people managed to get better jobs, better houses, and better schools than they had had before. But even now, while some black people are rich, most black people are still not as well off as white people, and they still suffer from racism that keeps them from getting good jobs or sending their kids to good schools. And most black people are still pretty much where they were before, working as unskilled labor for low wages for white people in the South. Cite this page: Carr, K.E. Civil Rights movement – American history. Quatr.us Study Guides, August 14, 2017. Web. April 23, 2019.